DVDs are vulnerable to all sorts of damage when they're out of their castle (plastic cases). Just a minor, deep scratch could lead to the failure of DVD playback. That's why the DVD ripper software comes into being. But the current market is saturated with DVD rippers in uneven quality. Some do a remarkable job in homemade DVD ripping and copy (no DVD copy protection); some work brilliantly in dealing with commercial DVDs. The rest, may have the all-round DVD decryption software, but is hard to single out, large amount of time and energy needed. If you are seeking for a DVD decrypting sofitware to handle all kinds of DVD copy protection tech, here is the right place you stay at, for a thorough DVD encryption tip and a cover-all DVD decrypter are introduced below to let you trouble-free remove any DVD copy protection. 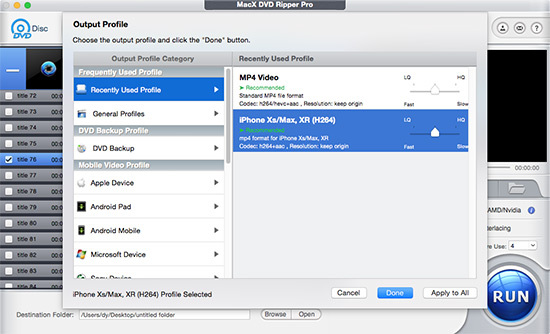 MacX DVD Ripper Pro - 5X faster to decrypt any DVDs (homemade or commercial), no matter DVD copy protected with CSS, Region Code 1-6, UOP, APS, or Sony ARccOS, Disney Fake, and rip DVD to MP4, MOV, MKV, iPhone iPad Android device with all quality kept in 1:1 ratio. 1What is DVD Copyright Protection? Content Scramble System Encryption (CSS)- utilizes a proprietary 40-bit stream cipher algorithm to automatically scramble DVD movie content makes it hard to decrypt and rip protected DVDs. No biggie! This common DVD encryption tech can be disabled with the solid DVD decrypter without breaking much of a sweat. 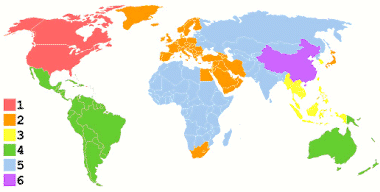 DVD Region Code- the whole world is divided into 6 regions. United States and Canada belong to Region Code 1; Central Europe, Northern Europe, Southern Europe, Western Europe and Japan is located in Region Code 2. Every region-locked DVD player is bound to play DVDs encode in its region. Certainly, there are numerous region-free DVD player such as 5KPlayer able to playback all DVD disc. Sony ARccOS DVD Protection - the common DVD copyright protection tech used on most Sony DVDs. The most obvious feature is to deliberately infuse bad sectors to DVDs so that the ordinary DVD players is powerless to playback Sony DVD movie, but DVD decryption and ripping software encounter Waterloo during Sony DVD backup procedure. Disney X-project protection-the full name is Digital Rights Management used by copyright holders to protect their intellectual property from piracy and unauthorized copy. This is reported to be the most complicated copyright protection tech adopted by Disney, which will result in 99 titles in Disney X-project DRM protected DVDs, up to 50GB file size in newer DVD and half-crash in Disney DRM DVD ripping process. But take it easy, the method to decrypt Disney DRM DVD solution is already available at your fingertips. 3How to Remove DVD Copy Protection and Rip Disney Sony DVD? With the cutting-edge MacX DVD Ripper Pro in hand, it's extremely easy to rip protected DVDs. As a self-contained DVD decrypter, it can aid you to bypass any DVD copyright protection and smoothly copy DVD to iPhone iPad digital formats just a click away without any third party involving. Below the step-by-step tutorial will show you how to decrypt a protected DVD at one go. After free downloading this DVD decrypter for Mac, click "DVD Disc" button to import the DVD files after you insert the DVD. You can also load DVD folder by clicking "DVD Path" button. Step 2. Choose the Output Video Format. Select the output video you desire. This DVD decrypter program allows users to rip protected DVD movies to MP4, MPEG, MKV, MOV, AVI, MP3, iPhone Ringtone, etc. various video audio formats. Step 4. Start DVD Decryption and Copying. After finish the above steps, click the "RUN" button to start decrypting DVD on Mac, you could view the conversion progress and are able to cancel the converting process at anytime. 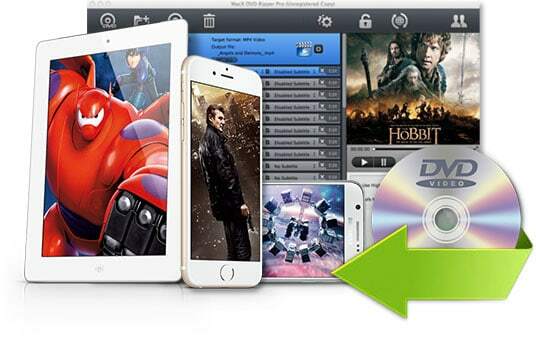 After removing the DVD encryption and riping it to digital formats, you can sync it to iPhone iPad with MacX MediaTrans. Note: This Mac DVD decrypter also supports to rip protected Lionsgate DVDs, damaged DVDs, workout DVDs, CPRM protected DVDs with original video quality and original 5.1 channels Dolby AC3/DTS audio and convert DVD to iPhone X/8/7/7 Plus, iPad Pro, iPad Mini 4, Surface Pro 4, Apple TV 4, Galaxy S9, Sony Xperia Z5, etc. 350+ mobile devices. This tutorial guide will introduce you an easy way to rip a DVD with a free DVD decrypter. Thus you are allowed to rip encrypted DVDs to MOV, MP4, FLV, MPEG, iTunes etc with free DVD decrypter on Mac OS, regardless of any copy protections. If your Handbrake cannot rip DVD with 99 titles, find your answer here. Just learn how to resolve the Handbrake error while decrypting DVD and ripping 99-title DVD using Handbrake alternative.